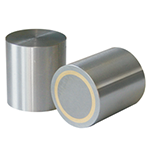 Alnico magnets have the best temperature coefficients of any magnet material. 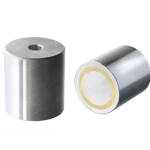 Alnico magnets are a best choice in extremely high temperature applications up to 550°C. Alnico magnets are Cast or Sintered, they can be produced in complex shapes or with complex magnetic fields. Weaker Isotropic alnico takes complex magnetic fields. Stronger anisotropic alnico has a fixed DoM axis. Cast Alnico 5 is the most common grade of Alnico, with the LNG44 variant of Alnico 5 (Alcomax 3) being the most popular.